Paul Pogba in his recent interviews was seen appreciating the Spanish giants, Real Madrid C.F and FC Barcelona. The Frenchman also lauded his fellow countryman Zinedine Zidane for his heroics with the Los Blancos. Pogba and his agent Mino Raiola are trying to seal a deal to Real Madrid since Zidane has taken over from Santiago Solari and it is believed even Zidane is interested in the services of the Manchester United star. Pogba last summer was really close to securing a move to the Camp Nou but instead ended up staying at the Old Trafford. The Frenchman never settled under Jose Mourinho and wanted to make a switch to Spain's top flight, La Liga. Since Ole Gunnar Solskjaer's appointment, Pogba has rejuvenated himself as he now has taken his goalscoring tally to 11 this season in the Premier League. He also has 9 assists registered to his name in 27 appearances. Ole has got the best out of Pogba since he sealed a move from Juventus and his exemplary performances could be the key to making a move to Bernabeu realistic. If reports in Spain are to be believed, Paul Pogba and Mino Raiola are trying to push for a switch to the Spanish capital. The Frenchman seems to have made up his mind that the ideal landing spot would be Real Madrid. As per Spanish publication Marca, Paul Pogba is serious about playing for Real Madrid next season. Even Zidane is a huge admirer of the 26-year-old and wants to bolster his squad by adding the dynamic Frenchman to his squad. The only problem that lies is that Manchester United aren't keen to let their star player leave for whom they paid an astonishing amount of 114 million euros in 2016. 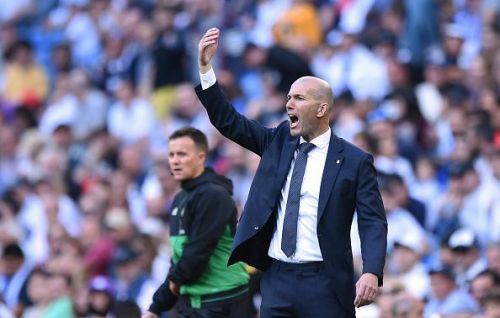 If Real are to make it a possibility they may have to break the bank but since Zidane is promised a sum north of 300 million Euros, the deal may go through. The Manchester United talisman sparked rumours earlier this week when he went on to state "Like I've always said, Real Madrid is a dream for anyone. It's one of the biggest clubs in the world. There is also [Zinedine] Zidane as a coach and it's a dream for anybody who likes football. For now, I'm at Manchester. We don't know what the future holds. I'm at Manchester and I'm happy." The recent outings of Pogba have fueled the interest of Los Blancos as well and Zidane reportedly wants to get the star midfielder to Bernabeu. Right now, Pogba is serving his nation helping them qualify for Euros 2020 and looks focused on finishing the season with Manchester United on a high but Real Madrid's interest may persuade him to leave the Premier League. Pogba would be an excellent addition to the Spanish giants and would release the pressure of ageing Luka Modric.